as a Eulogy to a prominent Egyptian Muslim Sheikh and Islamic Scholar. The book was written by his own brother, Sheikh Kamel Mansour. His name is Muhammad Ibn Muhammad Ibn Mansour. 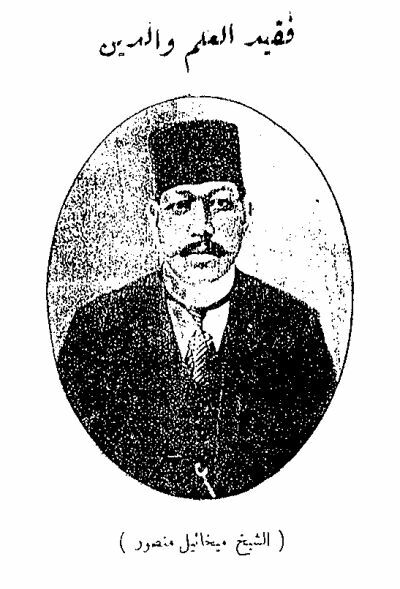 He was born in Sohag the Capital of the Province of Girga in Upper Egypt in the Year 1871. As it was the tradition that time, he went to study the Quran at a school annexed to a Mosque run by a good teacher, Sheikh Massoud El Azzazi. He studied and learned the Quran by heart in a few years. He showed intelligence and diligence. His father sent him over to a nearby town to study since it had an Islamic Center frequented by students from all over Upper Egypt. The center had a famous Sufi teacher: Sheikh Aly Badr El Alaam. When he started his studies, his teacher was very impressed by his intelligence and dedication and coached him towards more discipline and knowledge. Mansour spent 10 years devouring the books of learning. He mastered the Arabic Language, Prose, Poetry, Sufi principles, the Quran, Hadith, logic, the explanations of Muhammad's Contemporaries writings, philosophy, history, Sahih Muslim and Sahih Bukhari and a great number of Sufi books. Mansour finished his education and went back to Sohag around the end of 1891 where he spent his days reading and exploring the Quran and Hadith and the Sufi principles and Allah's revelations. He was a man of few words and spent the evenings contemplating and praying following the ways of the great Sufis. He then spent time writing poetry and prose to express his devotion to Islam and the Prophet, and gave his opinion on religious issues. That was the time he became popular and changed his life from an introvert to an extrovert and had a lot of friends and acquaintances. He was asked several times to lead the religious prayer (Imam) in the main Sohag Mosque. He also started an Islamic School with some of his friends. The school was filled with students who came to seek his wisdom and knowledge since its inception. In 1893 he decided to explore Christianity. He was driven by a desire to strengthen his faith and zeal in Islam and his desire to defend it. He studied some of the old manuscripts: "Finding the truth" which was written by El Hindi to contest and debate Christianity and Christians. He asked his spiritual leader Sheikh Ali Bader if he could invite Christians to debate with him on Christianity and Islam. The Sheikh was not in favor of the idea, replying that we are bound by our book which respects the Christians and Jews' beliefs. Mansour explained to his leader that Allah's will is to debate those who are not Muslims. Bringing them to Islam is the duty of every Muslim. His leader accepted the argument and told Mansour that he was afraid that Mansour would be spending his time debating with Christians and not enough time studying Islam and purifying himself. This was not accepted by Mansour. It looks like the Holy Spirit touched his heart towards truth and deliverance. Mansour talked to a Christian by the name of Michael whom he was acquainted with. Michael told him I can't debate or discuss these issues since I am not religious. He suggested talking to a Christian Orthodox priest. The priest debated with him but could not convince him. He suggested a blind religious man who could help him more. The man told him that he should go to the Anglican Church during the service and accompanied him there. Mansour was amazed at the peace and dedication and attention of the congregation. He was impressed by the depth and the spirituality of the prayers, hymns and the reading and study of the Bible. Mansour, like most Muslims thought that Christians were spending their time praying to and idolizing icons and statues of Jesus and the Apostles which he believed is paganism. After the service, a date and time for a meeting was agreed upon. They met and the discussion proceeded to subjects like the oneness of God and the Trinity. He spent the time in futile arguments with no end in sight. After the discussion he felt the superiority of Islam over Christianity. The Christian priest told him that we all seek God and suggested that in his prayer to seek the truth. Sheikh Mansour felt offended and answered: "Do you think I doubt my faith? I pray five times a day to Allah because I seek him and believe in him and his Islam". He spent the nights reading the Bible and alternating between doubt and belief. He would lock himself in his room day and night. He looked pale and disoriented. His family and friends were worried and thought that he may have a mental disease. I was the only one who was allowed to see him and he begged me not to disclose what I see. One day he came out from his room. He was his true self, happy, confident and you can see the peace on his face. He found the truth the way and the life. He discovered the sinful nature of man and the salvation through Christ the Lord. He found out that Jesus is the Way, the Truth and the Life. He started to frequent the Christians more often and his library became filled with Christian books. His Muslim friends did not know how to approach him in this regard since a man with such knowledge of Islam and respect of the community can not possibly have Christian tendencies. They tried to persuade him to stay away from his Christian friends. He succeeded in eluding them. He only went visiting his Christian friends at night and hiding his face. This did not help since they finally accused him of being a Kafir (non believer). Finally, he thought that he had to face his accusers. He went to the Anglican Church and asked to be baptized. The Anglican Church was afraid of the reaction of the Islamic community in Sohag and procrastinated. He decided to approach the Catholic priest asking for Baptism. The priest replied that he is willing to baptize him and got in touch with the Catholic authorities in Cairo in that respect. The reply came from Cairo asking him to travel there. We saw him suddenly leaving the Muslim school with one of his partners and left all his belongings to go to Cairo. He joined the Catholic Church in Cairo close to the end of 1894 and was baptized. He chose the name Michael. No more than one week after he left Sohag that the news was all over the place, not only in Sohag but in all the neighboring cities. We were inundated with visitors at home of those who were seeking the truth. The situation in his home was compared to a loss of a son physically and spiritually. His mother was crying and wailing. His aunts and brothers were accepting condolences and his friends could not believe the loss of such a distinguished Muslim scholar. His father decided to go to Cairo and find out for himself what was happening. He found Mansour in the Catholic Church. He discussed the situation with him. Pleaded with him to change his mind, even threatened him to no avail. He finally asked him to write a letter to the authorities in Sohag denying the allegations. Mansour replied: You are asking me to lie, which in itself is a sin. Furthermore Christ said: "whoever disowns me before men, I will disown him before my Father." The father returned back to Sohag full of sorrow and shame. He remained a recluse for a long time unable to face the neighbors or answer their questions. His brothers sent him letters trying to persuade him to change his mind. Some of the Sheikhs sent him letters attacking Christianity and the Bible and begging him to return back to Islam. This Ends the Old chapter of Sheikh Mansour and Begins the New Chapter of Michael. In August 1895 he went with a delegation to Rome to meet the Pope Leo XIII, wearing his Islamic attire. The Pope asked him to approach and blessed him and prayed that Jesus would strengthen his belief. The Pope also gave him some souvenirs and pictures to take home. This visit impressed all who saw or heard of him in Rome. Newsmen flocked over to the hotel where he was staying and even followed him and took pictures of him on the way to the Vatican. When he returned from Rome he looked for more studies in Christianity. When he couldn't find what he was looking for in Catholicism he went back to the Anglican faith in December 1897. He said: "I learned so much from the character of the Christian prophets that drew me even closer to Jesus to know through the Bible that he is the only redeemer for the world." His heart was filled with love for all of them. Before his death, he sent me a letter telling me to talk to them one by one and tell them I died in the peace of Jesus the Lord. Ask them to come to him to receive salvation. An incident happened later when an uncle of Michael decided, unknown to the family to travel to Cairo and kill him to rid his family from the shame of his conversion to Christianity. He found out where he lived and watched him for several days. Then one night he hid in a dark corner with a knife in his hand. When Michael approached he swung the knife at him but Michael saw him and hit him on the wrist with his walking stick. The knife fell to the ground. Michael then held him firmly and told him: "I could take you to the authorities to be punished for attempting to murder me, but Jesus whom I believe in asked me to forgive you." I want you to promise me to go back to Sohag tonight. I will take you to the train station, buy you a ticket and send you home. The uncle was grateful and did what Michael requested. On the way to the station Michael talked to him a lot about Christ and his salvation. He also wrote us about the incident. My father was mad at my uncle and disassociated with him for over two years. He told my uncle: "This is my own beloved son, dont you know that he might change his mind and return back to Islam?" The people of Sohag continued the insults and the threatening letters sent to Michael. He was attacked physically several times from known and unknown persons in Cairo. He was strong in his belief in Christ and never denied his faith not by word or deed or silence. He was bold in showing his belief. "If you think I lost something tell me what it is." I said "You lost everything, Your family, your reputation, your career as a learned Islamic Scholar, your career could have shot all the way to the top." He replied: "All this doesnt compare to being with Jesus even for one hour." I remember the first year after his baptism, we asked him to continue sending his letters to the family as Muhammad Mansour, and he refused completely. We suggested that he would use the abbreviation M. M. which should make him happy since it also stands for Michael Mansour. He refused saying that this doesnt glorify Christ. At one time the editor of a famous newspaper came to visit me with graduates of Al Azhar Islamic University. One of them asked him: "Arent you sorry you became a Christian?" He replied: "I am only sorry for the time I spent away from Christ and his blessings before I became a Christian." He once told me: "When I was given the Bible for the first time and I started to read it, I finally found things I had never found before, The Creation in such a beautiful and convincing manner, the history of the prophets in detail which was only mentioned briefly in Quran. For God so loved the world, that he gave his one and only Son, that whosoever believeth in him should not perish, but have everlasting life. He was a decent and kind person. He always cheered up those who were sad by his good humor and jokes. He was very popular and well loved by all who knew him. Every time he went to a coffee house he was surrounded by tens of people who loved his congenial company. Any time he walked down the street both Christians and Muslims were greeting him. He commanded love and respect. He was also very generous; he looked after the poor and supported poor orphans and widows despite his limited financial means. He always said I am rich because Christ is in me. He was also very courageous. I remember the night we had a meeting in Azbakia Church in Cairo and about 700 people mostly thugs and trouble makers were screaming: "We want to kill him. We will not go home before we kill him." The organizers of the meeting asked him to leave by the back door. He refused. He walked to the podium and bared his chest screaming those who want to kill me can advance now. I am not any better than who died for me. I cant explain what happened after that. Suddenly they were all quite. Most of them left the meeting. Those thugs who remained escorted him safely to his home. God wants to send me to them. One day I remember one of the Islamic Scholars approached me and asked me if I am Michaels brother. I replied in the affirmative. He said: "Your brother is a literary giant. I almost accused him of being a liar. Every time he had a speech he was quoting impromptu excerpts from enormous Islamic volumes. I didnt think that he could remember all what he used in his speeches. I decided one day to write down what he was saying and the sources. I went after the meeting to Al Azhar Library and consulted the books he mentioned. I was flabbergasted; he quoted 12 volumes and was accurate in each and every instance." His Church sermons were so well attended and there were those who wrote and memorized parts of his speech. He did not speak English where he can draw from the Bible studies. His only source was the Bible itself. He spent his time teaching the Bible, writing articles in newspapers and magazines, visiting schools in upper and lower Egypt. I will never forget the day I asked him for a Bible. I will never forget the smile on his face and the tears that followed. He said to me: "I have been praying to God in tears for you for months. I wanted you to read it and understand it so that you can find in it salvation." I admit at first I was ashamed of his conversion to Christianity and spent time at first talking to other Muslim scholars trying to get them to persuade him to return. I even was thinking of resorting to some thugs to threaten him. I often kept thinking why did he become Christian? The only answer is that he loved Christ so much that nothing else mattered. That is why I asked for the Bible. He had elevated blood cholesterol for a long time and was not aware of it. He was a strong man and it looks like his stamina kept him going. One day we had to rush him to the hospital for a kidney failure. Despite the fact that we got him the best Doctors in town, it was too late. Even on his death bed and for two days he kept saying: "By grace we are saved," and "I thank him because he saved me by his Grace." The priest came to see him and said to him: "Arent you afraid to die Sheikh Michael?" Michael smiled and said: "How could I be afraid when Jesus right hand is sustaining me?" Then he said three times: "How could I be afraid of death when Jesus preceded me and banished the fear of the grave." On Wednesday the 29th of May 1918 he passed on. We had hundreds of telegrams of condolences and the funeral took place on Thursday. There were hundreds and hundreds of Muslims, and Christians of different denominations. All came because they loved him and were so sorry to see such a servant of God wither away so soon.